1. Mix the mince, breadcrumbs, egg, anchovies, parsley and some seasoning together in a large bowl until thoroughly combined – the easiest way to do this is with your hands. Roll into about 20 walnut-sized balls. Cover and chill while you make the sauce. 2. Heat a tablespoon of oil in a medium pan, add the garlic, tomatoes, rosemary, chilli flakes and seasoning, and simmer for 5-8 minutes until pulpy. Stir in the vinegar and check the seasoning. 3. Roll the meatballs in the seasoned flour. Heat the remaining oil in a non-stick frying pan and fry the meatballs in batches for 5-6 minutes until browned on all sides. Drain on kitchen paper and add to the tomato sauce. 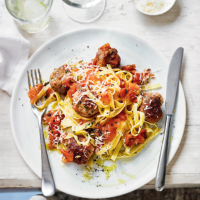 Simmer for 5 minutes until the pork is cooked through with no pink meat then serve with the freshly cooked tagliatelle and grated fresh Parmigiano Reggiano.